The 2014 United States House of Representatives elections were held on November 4, 2014, in the middle of President Barack Obama's second term in office. Elections were held for all 435 seats of the House of Representatives, representing the 50 states. Elections were also held for the non-voting delegates from the District of Columbia and four of the five territories. The winners of these elections served in the 114th United States Congress, with seats apportioned among the states based on the 2010 United States Census. The Republicans won 16 seats from Democrats, while three Republican-held seats turned Democratic. The Republicans achieved their largest majority in the House since 1928 due to a sizeable Republican wave. Combined with the Republican gains made in 2010, the total number of Democratic-held House seats lost under Barack Obama's presidency in midterm elections rose to 77 with these elections. This marked the highest number of House seats lost under a two-term president of the same party since Harry S. Truman. With 36.4% of eligible voters voting, the voter turnout was the lowest since 1942. Notable freshmen included future U.S. Secretary of the Interior Ryan Zinke and future U.S. Senator Martha McSally. Open seats highlighted by party. Forty-one representatives retired from their seats. Sixteen Democrats (seventeen, including the delegate from the Virgin Islands) retired from their seats. Virgin Islands: Donna Christian-Christensen: Retired to run for Governor of the Virgin Islands. Twenty-five Republicans retired from their seats. Louisiana 5: Vance McAllister (R) lost a Nonpartisan blanket primary to Jamie Mayo (D) and Ralph Abraham (R). Abraham went on to win the runoff. Republican hold. Massachusetts 6: John F. Tierney (D) lost renomination to Seth Moulton (D), who went on to win the general election. Democratic hold. Michigan 11: Kerry Bentivolio (R) lost renomination to David Trott (R), who went on to win the general election. Republican hold. Texas 4: Ralph Hall (R), lost renomination to John Ratcliffe (R), who went on to win the general election. Republican hold. Virginia 7: Eric Cantor (R) lost renomination to Dave Brat (R), who went on to win the general election. Republican hold. Republicans had a net gain of nine seats, taken from Democrats. Eleven Democrats (twelve, including the delegate from American Samoa) lost re-election to Republicans. Arizona 2: Ron Barber (D), first elected in 2012, lost to Martha McSally (R). Florida 26: Joe Garcia (D), first elected in 2012, lost to Carlos Curbelo (R). Georgia 12: John Barrow (D), first elected in 2004, lost to Rick W. Allen (R). Illinois 10: Brad Schneider (D), first elected in 2012, lost to Bob Dold (R). Illinois 12: Bill Enyart (D), first elected in 2012, lost to Mike Bost (R). Nevada 4: Steven Horsford (D), first elected in 2012, lost to Cresent Hardy (R). New Hampshire 1: Carol Shea-Porter (D), first elected in 2006, lost seat in 2010, re-elected in 2012, lost to Frank Guinta (R). New York 1: Tim Bishop (D), first elected in 2002, lost to Lee Zeldin (R). New York 24: Dan Maffei (D), first elected in 2008, lost seat in 2010, re-elected in 2012, lost to John Katko (R). Texas 23: Pete Gallego (D), first elected in 2012, lost to Will Hurd (R). West Virginia 3: Nick Rahall (D), first elected in 1976, lost to Evan Jenkins (R). American Samoa: Eni Faleomavaega (D), first elected in 1988, lost to Amata Coleman Radewagen (R). Two Republicans lost re-election to Democrats. Florida 2: Steve Southerland (R), first elected in 2010, lost to Gwen Graham (D). Nebraska 2: Lee Terry (R), first elected in 1998, lost to Brad Ashford (D). Republicans had a net gain of four seats previously held by Democrats. Five open seats previously held by Democrats were won by Republicans. Iowa 1: Bruce Braley (D) retired to run for U.S. Senate. Seat won by Rod Blum (R). Maine 2: Mike Michaud (D) retired to run for Governor of Maine. Seat won by Bruce Poliquin (R). New York 21: Bill Owens (D) retired. Seat won by Elise Stefanik (R). North Carolina 7: Mike McIntyre (D) retired. Seat won by David Rouzer (R). Utah 4: Jim Matheson (D) retired. Seat won by Mia Love (R). One open seat previously held by a Republican was won by a Democrat. California 31: Gary Miller (R) retired. Seat won by Pete Aguilar (D). 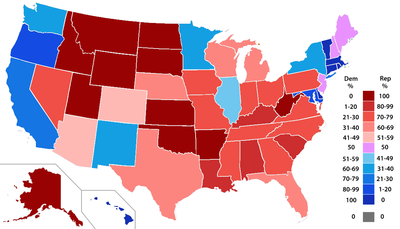 Red denotes House races won by Republicans while Blue denotes those won by Democrats. Italics denote a seat that flipped parties. Competitive seats highlighted by party. The following are the predictions for House districts where at least one out of the Cook Political Report, Daily Kos Elections, the Rothenberg Political Report, Sabato's Crystal Ball and Real Clear Politics did not agree that the district was "safe Democratic" or "safe Republican." Incumbents not running for re-election have parentheses around their names, while incumbents with a caret (^) sought re-election, but were defeated in the primary election. Note that safeness of a district is not necessarily a prediction as to outcome. 195 seats were viewed as "safe Republican" and 159 as "safe Democratic" by all five of these sources. Voters had the choice of only one major political party in more than one in six U.S. House elections nationwide, including more than one in four races in the Southern region. Five special elections were held in 2014. Two elections were held concurrent with the November elections. The winners received a seniority advantage over other freshmen, as their seniority starts on the day of the elections. Three elections were held separate from the November general elections. Florida 13 Bill Young Republican 1970 Incumbent died October 18, 2013, having already announced his retiretment. New member elected March 11, 2014. Florida 19 Trey Radel Republican 2012 Incumbent resigned January 27, 2014. New member elected June 24, 2014. New Jersey 1 Rob Andrews Democratic 1990 (Special) Incumbent resigned February 18, 2014. New member elected November 4, 2014. North Carolina 12 Mel Watt Democratic 1992 Incumbent resigned January 6, 2014 to become Director of the Federal Housing Finance Agency. Primary elections were held May 6, 2014. Virginia 7 Eric Cantor Republican 2000 Incumbent resigned August 18, 2014, having lost renomination to the next term. Candidates were nominated by their respective parties. R+28 Robert Aderholt Republican 1996 Incumbent re-elected. √ Robert Aderholt (Republican) unopposed. R+28 Spencer Bachus Republican 1992 Incumbent retired. D+20 Terri Sewell Democratic 2010 Incumbent re-elected. √ Terri Sewell (Democratic) unopposed. R+3 Ron Barber Democratic 2012 Incumbent lost re-election. D+16 Ed Pastor Democratic 1991 Incumbent retired. R+8 Tim Griffin Republican 2010 Incumbent retired to run for Lieutenant Governor of Arkansas. R+15 Tom Cotton Republican 2012 Incumbent retired to run for the U.S. Senate. D+17 George Miller Democratic 1974 Incumbent retired. R+3 Buck McKeon Republican 1992 Incumbent retired. D+5 Gary Miller Republican 1998 Incumbent retired. D+11 Henry Waxman Democratic 1974 Incumbent retired. R+7 John Campbell Republican 2005 Incumbent retired. R+11 Cory Gardner Republican 2010 Incumbent retired to run for U.S. Senate. R+6 Steve Southerland Republican 2010 Incumbent lost re-election. R+6 Gus Bilirakis Republican 2006 Incumbent re-elected. √ Gus Bilirakis (Republican) unopposed. D+11 Kathy Castor Democratic 2006 Incumbent re-elected. √ Kathy Castor (Democratic) unopposed. D+12 Ted Deutch Democratic 2010 Incumbent re-elected. √ Ted Deutch (Democratic) unopposed. R+6 Mario Diaz-Balart Republican 2002 Incumbent re-elected. √ Mario Diaz-Balart (Republican) unopposed. R+4 Joe Garcia Democratic 2012 Incumbent lost re-election. R+2 Ileana Ros-Lehtinen Republican 1989 Incumbent re-elected. √ Ileana Ros-Lehtinen (Republican) unopposed. R+9 Jack Kingston Republican 1992 Incumbent retired to run for U.S. Senate. R+19 Lynn Westmoreland Republican 2004 Incumbent re-elected. √ Lynn Westmoreland (Republican) unopposed. D+21 Hank Johnson Democratic 2006 Incumbent re-elected. √ Hank Johnson (Democratic) unopposed. D+32 John Lewis Democratic 1986 Incumbent re-elected. √ John Lewis (Democratic) unopposed. R+15 Austin Scott Republican 2010 Incumbent re-elected. √ Austin Scott (Republican) unopposed. R+14 Paul Broun Republican 2007 Incumbent retired to run for U.S. Senate. R+19 Phil Gingrey Republican 2002 Incumbent retired to run for U.S. Senate. Republican hold. √ Barry Loudermilk (Republican) unopposed. R+9 John Barrow Democratic 2004 Incumbent lost re-election. D+16 David Scott Democratic 2002 Incumbent re-elected. √ David Scott (Democratic) unopposed. R+26 Tom Graves Republican 2010 Incumbent re-elected. √ Tom Graves (Republican) unopposed. D+18 Colleen Hanabusa Democratic 2010 Incumbent retired to run for U.S. Senate. D+8 Brad Schneider Democratic 2012 Incumbent lost re-election. Even Bill Enyart Democratic 2012 Incumbent lost re-election. D+5 Bruce Braley Democratic 2006 Incumbent retired to run for U.S. Senate. Even Tom Latham Republican 1994 Incumbent retired. R+15 Vance McAllister Republican 2013 Incumbent lost renomination. R+21 Bill Cassidy Republican 2008 Incumbent retired to run for U.S. Senate. D+2 Mike Michaud Democratic 2002 Incumbent retired to run for Governor. D+13 Richard Neal Democratic 1988 Incumbent re-elected. √ Richard Neal (Democratic) unopposed. D+8 Jim McGovern Democratic 1996 Incumbent re-elected. √ Jim McGovern (Democratic) unopposed. D+6 Joe Kennedy Democratic 2012 Incumbent re-elected. √ Joe Kennedy (Democratic) unopposed. D+14 Katherine Clark Democratic 2013 Incumbent re-elected. √ Katherine Clark (Democratic) unopposed. D+4 John Tierney Democratic 1996 Incumbent lost renomination. D+31 Mike Capuano Democratic 1998 Incumbent re-elected. √ Mike Capuano (Democratic) unopposed. D+6 Stephen Lynch Democratic 2001 Incumbent re-elected. √ Stephen Lynch (Democratic) unopposed. R+5 Dave Camp Republican 1990 Incumbent retired. R+2 Mike Rogers Republican 2000 Incumbent retired. R+4 Kerry Bentivolio Republican 2012 Incumbent lost renomination. D+15 John Dingell Democratic 1955 Incumbent retired. D+29 Gary Peters Democratic 2008 Incumbent retired to run for U.S. Senate. R+10 Michele Bachmann Republican 2006 Incumbent retired. R+7 Steve Daines Republican 2012 Incumbent retired to run for U.S. Senate. R+4 Lee Terry Republican 1998 Incumbent lost re-election. D+4 Steven Horsford Democratic 2012 Incumbent lost re-election. R+1 Carol Shea-Porter Democratic 2012 Incumbent lost re-election. R+1 Jon Runyan Republican 2010 Incumbent retired. D+14 Rush Holt Jr. Democratic 1998 Incumbent retired. R+2 Tim Bishop Democratic 2002 Incumbent lost re-election. D+3 Carolyn McCarthy Democratic 1996 Incumbent retired. Even Bill Owens Democratic 2009 Incumbent retired. D+5 Dan Maffei Democratic 2012 Incumbent lost re-election. R+10 Howard Coble Republican 1984 Incumbent retired. R+12 Mike McIntyre Democratic 1996 Incumbent retired. R+18 Jim Bridenstine Republican 2012 Incumbent re-elected. √ Jim Bridenstine (Republican) unopposed. R+12 James Lankford Republican 2010 Incumbent retired to run for U.S. Senate. R+2 Jim Gerlach Republican 2002 Incumbent retired. D+13 Allyson Schwartz Democratic 2004 Incumbent retired to run for run for Governor. D+15 Mike Doyle Democratic 1994 Incumbent re-elected. √ Mike Doyle (Democratic) unopposed. R+2 Charlie Dent Republican 2004 Incumbent re-elected. √ Charlie Dent (Republican) unopposed. R+10 Tim Murphy Republican 2002 Incumbent re-elected. √ Tim Murphy (Republican) unopposed. R+11 Mark Sanford Republican 2013 Incumbent re-elected. √ Mark Sanford (Republican) unopposed. Ralph Hall Republican 1980 Incumbent lost renomination. Republican hold. √ John Ratcliffe (Republican) unopposed. Pete Gallego Democratic 2012 Incumbent lost re-election. Steve Stockman Republican 2012 Incumbent retired to run for U.S. Senate. Jim Matheson Democratic 2000 Incumbent retired. D+27 Bobby Scott Democratic 1992 Incumbent re-elected. √ Bobby Scott (Democratic) unopposed. R+10 Vacant Incumbent Eric Cantor lost renomination. Doc Hastings Republican 1994 Incumbent retired. Shelley Moore Capito Republican 2000 Incumbent retired to run for U.S. Senate. Nick Rahall Democratic 1976 Incumbent lost re-election. Tom Petri Republican 1979 Incumbent retired. N/A Eni Faleomavaega Democratic 1988 Incumbent lost re-election. N/A Donna Christian-Christensen Democratic 1996 Retired to run for USVI Governor. ^ a b Haas, Karen L. (March 9, 2015). "Statistics of the Congressional Election of November 4, 2014". Office of the Clerk. U.S. House of Representatives. Retrieved February 22, 2016. ^ "Republicans match post-WWII record after holding two La. House seats". Fox News Channel. December 7, 2014. Retrieved December 7, 2014. ^ Montanaro, Domenico; Wellford, Rachel; Pathe, Simone (November 10, 2014). "2014 midterm election turnout lowest in 70 years". PBS NewsHour. Retrieved August 30, 2015. ^ "U.S. House results -- 2014 Election Center -- Elections and Politics from CNN.com". CNN. Retrieved January 26, 2018. ^ a b Cahn, Emily; Livingston, Abby (February 27, 2014). "Ed Pastor to Retire in 2014". Roll Call. Retrieved February 27, 2014. ^ Fernandez, Lisa (January 13, 2014). "Congressman George Miller Announces Retirement After 40 Years". NBC Bay Area. Retrieved January 13, 2014. ^ Weisman, Johnathan (January 30, 2014). "Henry Waxman, Key Democrat and Force for Health Care Law, Is to Retire". NY Times. Retrieved January 30, 2014. ^ Alex Isenstadt (February 18, 2014). "California Democrat Gloria Negrete McLeod quitting House". Politico. Retrieved April 12, 2014. ^ "Rep. Colleen Hanabusa to challenge Sen. Brian Schatz in 2014 primary". Hawaii News Now. April 23, 2013. Retrieved February 27, 2014. ^ Jacobs, Jennifer (February 7, 2013). "Bruce Braley will run for Harkin's Senate seat". The Des Moines Register. Retrieved February 8, 2013. ^ Blake, Aaron (June 13, 2013). "Rep. Mike Michaud steps into Maine governor's race". The Washington Post. Retrieved February 27, 2014. ^ Bresnahan, John; Isenstadt, Alex (February 24, 2014). "John Dingell announces plans to retire". Politico. Retrieved February 24, 2014. ^ Wilson, Reid (April 29, 2013). "Gary Peters To Announce Senate Bid". National Journal. Archived from the original on February 27, 2014. Retrieved February 27, 2014. ^ Isenstadt, Alex (February 18, 2014). "New Jersey Democrat Rush Holt to quit House". Politico. Retrieved February 18, 2014. ^ a b Bresnahan, John; Sherman, Jake; Isenstadt, Alex (January 8, 2014). "Carolyn McCarthy, Mike McIntyre to retire". Politico. Retrieved January 8, 2014. ^ Sherman, Jake; Isenstadt, Alex (January 14, 2014). "New York Democrat Bill Owens to retire from House". Politico. Retrieved February 27, 2014. ^ Camia, Catalina (April 9, 2013). "Dem Rep. Schwartz jumps into Pa. governor's race". USA Today. ^ Livingston, Abby (December 17, 2013). "Democrat Jim Matheson Announces Retirement (Updated)". Roll Call. Retrieved December 17, 2013. ^ Dumain, Emma (January 15, 2013). "Virginia's Moran Announces Retirement From Congress (Updated) (Video)". Roll Call. Retrieved January 25, 2013. ^ Jaffe, Alexandra (September 30, 2013). "Ex-Financial Services chairman Bachus to retire after 11 terms". The Hill. Retrieved September 30, 2013. ^ DeMillo, Andrew (October 21, 2013). "GOP Rep. Tim Griffin Won't Run for 3rd Term". ABC News. Archived from the original on October 28, 2013. ^ Glueck, Katie (July 31, 2013). "Arkansas Tom Cotton to run for U.S. Senate". Politico. Retrieved July 31, 2013. ^ Cassata, Donna (January 16, 2014). "U.S. Rep. Howard 'Buck' McKeon announces retirement from Congress after 21 years". San Bernardino Sun. ^ Aaron Blake (February 12, 2014). "Rep. Gary Miller (R-Calif.) to retire". The Washington Post. ^ Emami, Chris (June 27, 2013). "BREAKING NEWS: Congressman John Campbell Retiring". OC Political. Retrieved June 27, 2013. ^ Bartels, Lynn (February 26, 2014). "U.S. Rep. Cory Gardner to enter U.S. Senate race against Mark Udall". The Denver Post. Retrieved February 26, 2014. ^ Sullivan, Sean (May 2, 2013). "Kingston joins Republican Senate field in Georgia". The Washington Post. Retrieved May 29, 2013. ^ Sullivan, Sean (February 6, 2013). "Paul Broun announces Georgia Senate bid". Washington Post. Retrieved February 7, 2013. ^ "Gingrey officially launches Senate bid". Marietta Daily Journal. March 27, 2013. Retrieved March 27, 2013. ^ Blake, Aaron (December 17, 2013). "Rep. Tom Latham (R-Iowa) won't seek reelection". Washington Post. Retrieved December 17, 2013. ^ "Louisiana Senate 2014: Bill Cassidy to challenge Mary Landrieu". Politico. April 2, 2013. Retrieved April 3, 2013. ^ "Dave Camp to retire after his current term". The Washington Post. March 31, 2014. Retrieved March 31, 2014. ^ "Rep. Mike Rogers to retire, launch national radio show". Washington Post. March 28, 2014. Retrieved March 28, 2014. ^ Johnston, Ian (May 29, 2013). "Michele Bachmann: I'm quitting my House seat in 2014". NBC News. Retrieved May 29, 2013. ^ Dennison, Mike (November 6, 2013). "Daines officially launches U.S. Senate bid; game on for Montana's open seat". Billings Gazette. Retrieved November 6, 2013. ^ Cahn, Emily (November 6, 2013). "Jon Runyan Will Not Seek Re-Election in 2014 (Updated)". Roll Call. Retrieved November 6, 2013. ^ Cahn, Emily (November 7, 2013). "Howard Coble Announces Retirement". Roll Call. Retrieved November 7, 2013. ^ "GOP's Jim Gerlach not running in 2014". Politico. Politico. January 6, 2014. Retrieved January 6, 2014. ^ "In surprise move, Steve Stockman challenges John Cornyn". Politico. Politico. December 9, 2013. Retrieved December 10, 2013. ^ "Virginia Rep. Frank Wolf to Retire". ABC News. December 17, 2013. Retrieved December 17, 2013. ^ "Rep. Doc Hastings (R-Wash.) to retire". The Washington Post. February 13, 2014. Retrieved February 13, 2014. ^ "Capito Says She'll Challenge Rockefeller for Senate Seat". The Intelligencer & Wheeling News Register. Associated Press. November 26, 2012. Retrieved November 26, 2012. ^ "Longtime Wisconsin GOP Rep. Tom Petri to Retire". Businessweek. Retrieved May 20, 2014. ^ "Challenger Trott Defeats Bentivolio, Ends Tenure of 'Accidental Congressman'". Detroit Free Press. Retrieved August 10, 2014. ^ "Oldest congressman, Ralph Hall, 91, ousted by John Ratcliffe". The Dallas Morning News. Retrieved May 27, 2014. ^ Barabak, Mark Z. "The earthquake that toppled Eric Cantor: How did it happen?". Los Angeles Times. Retrieved June 11, 2014. ^ Ostermeier, Eric (October 7, 2014). "Blowout: More Than 1 in 6 US House Races Have Just One Major Party Nominee". Smart Politics. ^ "2014 House Race Ratings for November 3, 2014". House: Race Ratings. Cook Political Report. Retrieved November 3, 2014. ^ "Daily Kos Elections House race ratings: Initial ratings for 2014". Daily Kos Elections. Retrieved November 4, 2014. ^ "2014 House Ratings (October 24, 2014)". House Ratings. The Rothenberg Political Report. Retrieved October 24, 2014. ^ "2014 House". Sabato's Crystal Ball. April 10, 2014. Retrieved April 11, 2014. ^ Bowman, Bridget (October 2, 2014). "Kerry Bentivolio to Wage Write-In Campaign". Roll Call. Retrieved December 1, 2014. ^ Alex Isenstadt (October 18, 2013). "Bill Young, longest-serving House Republican, dies". Politico. Retrieved October 19, 2013. ^ "NC SBE Election Results". ncsbe.gov. Archived from the original on January 27, 2015. Retrieved March 13, 2015.